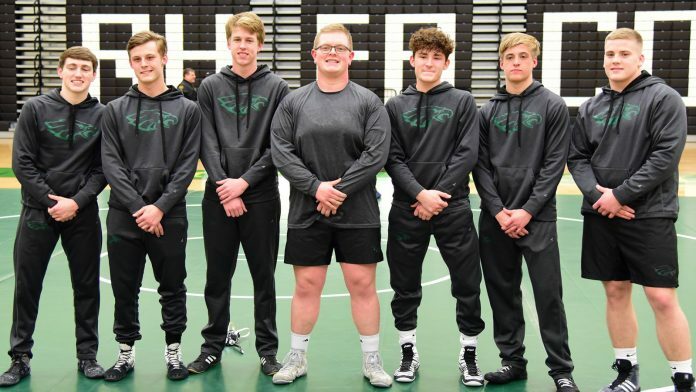 Evensville, TN — Rhea County High School Wrestling team took time before their wrestling matches to celebrate the careers of seven senior wrestlers. Being honored were Garrett Smith, Wyatt Stumbo, Colton Edwards, Jagger Hickman, Kobie Thurman, Noah Varner and Nic Brock. After the ceremony the Eagles went up against CAK and Polk County High School. In the first match of the night, Christian Academy of Knoxville won 44-27. Garrett Smith put Eagles into scoring line with his pin in 220 division. Colton Edwards won via forfeit to pull Eagles even 12-12 but CAK scored next 26 points to take commanding 38-12 lead. Wyatt Stumbo’s pin in 145 pound match gave Eagles six points and Jagger Hickman(152)picked up three points in his win. Noah Varner(160 lbs) picked up last six points on forfeit. The Eagles picked up four pins against Polk County with Garrett Smith(220 lbs), Jacob Judkins(120 lbs), Noah Varner(160 lbs) and Perez(170 lbs) as they won 51-18. Also winning for Eagles were Jacob Scruggs(182 lbs), Colton Edwards(285 lbs), Logan Dougan(132 lbs) and Jagger Hickman(152 lbs. Head coach Taylor Ownbey took time to talk about the upcoming post season opportunities for his wrestlers and looked back at careers of his seven seniors.